Pets are family, here at Carpet Repair of Arizona, if your anything like us you love yours just the same. That’s why we offer Pet Damaged Carpet Repair services for all types of carpet needs. 80% of our business originates from Pet Damaged Carpet Repairs. Our specialists repair only the damaged carpet restoring your flooring to its original beauty. Pets come in all shapes and sizes which means their “accidents” come in all shapes and sizes. Especially with puppies, it’s only a matter of time till they use your carpet as a chewing toy or their backyard to potty in. Lets not forget about cats, those cuties love to scratch and sharpen their claws on anything, often becoming a spot on your carpet or furniture. Covering up the damage with a rug is only a temporary fix and usually results in further damage. Instead of pretending the damage doesn’t exist call our professional experts and repair it today, leaving no evidence behind. Our Pet Damaged Carpet Repair services are affordable and a wonderful solution for your destroyed carpet. Pet damaged carpet repair doesn’t have to be expensive, and replacing your carpet isn’t always the only option available. Carpet Repair of Arizona takes pride in their affordable solutions for all your carpet needs. We will tackle any challenge when it comes to pet damage carpet repair situations, here are a few images of our recent Pet Damaged Carpet Repair calls. Our immensely trained experts have years of experience with pet damaged carpet repairs of all types. While making your appointment we will ask if you have extra matching carpet on hand for repairs. It’s completely okay if you don’t have extra matching carpet we’ll just have you send a photo of carpet and our installer will bring the closest matching sample he can find. When our customers don’t have extra carpet on hand we’ll pull matching carpet, for repairs, from an inconspicuous place in your home. We use an exact match for repairs and our closely matching samples to repair the area we pull from. This process will leave little to no evidence your carpet was ever damaged. Its time to throw away the rug and repair that carpet! Grab your phone and give Carpet Repair of Arizona a call. We will keep money in your wallet and bring your carpet back to life with a simple repair. 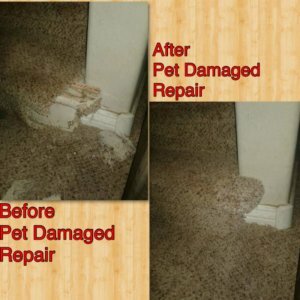 Call today and ask about our $75 special for pet damage carpet repair. Why continue to over pay for costly replacement and/or repairs?